There is nothing like the sensation of operating your yacht from the flybridge. The view ahead is better than any onboard, beautiful weather completely surrounding you as you sit atop the world, enroute to your next perfect getaway. While so many other builders are focused on center console and bow rider catamarans, ArrowCat has made its reputation building cats that offer more interior space protected from the elements while delivering handling and stability that is unparalleled. With the lower levels completely airconditioned and offering a galley capable of gourmet meals, a salon that converts to a lounge accompanied by 2 staterooms and 2 heads, depending on your choice of layouts. Our latest model is taking the bow rider concept to a whole other level. 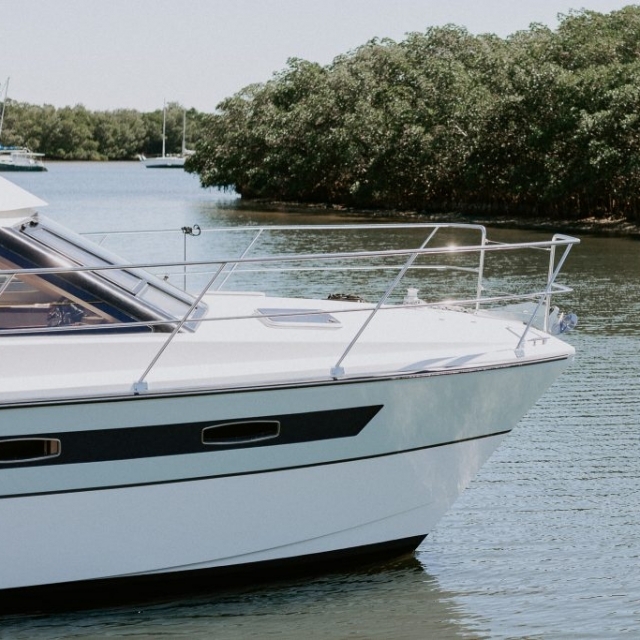 the outboard powered 420 FlyBridge, offers enough upper seating to be the envy of day-boats while maintaining all of the comforts of a luxury condo below. Having a draft shallow enough to beach alongside the center consoles is not just for bowriders anymore. Thanks to the carbon fiber infusion method, the flybridge version is only 1500 pounds more than our Sedan version- the toughest decision won’t be when to go, but where to go!